Smooth Milk chocolate with Honey and Almond Nougat and raisins. 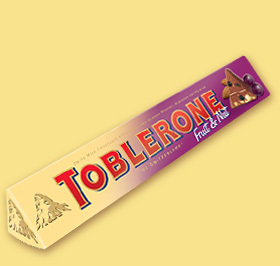 This delicious chocolate is available in 100g and 400g sizes. Please click on the bar to show the individual nutritional information. Ingredients: Sugar, raisins (14%), whole milk powder, cocoa butter, cocoa mass, honey (3%), milk fat, almonds (1.6%), emulsifier: soya lecithin, egg white, flavouring (vanillin).